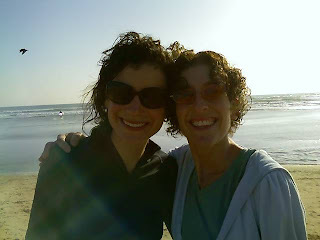 I went to California last weekend to be with my sisters. This long weekend trip was a gift from my mom, dad and my sisters for my 40th birthday (which was in December). One of my sisters (Laura – in the picture with me) lives in Washington, DC, and she was attending a conference in California (where my other sister, Melanie, lives). Laura stayed the weekend after her conference to be with me when I came out there, so we three could spend the weekend together. I had never been to CA before, and rarely have the opportunity to travel, so this was a very rare and wonderful gift. This being a long weekend, I didn’t have teaching obligations, so this was the perfect time to go. I got to the airport, after having made many arrangements with my mom and mother-in-law, who were watching the kids and making dinner. My flight out of Cleveland was supposed to get me to a connecting flight in Minneapolis, MN. Suddenly there was an announcement that the airplane had a flat tire and they were waiting for a mechanic to change it. It may or may not cause a delay. I waited a few minutes, concerned about making my connecting flight. The next announcement said that the plane needed special tires brought in – driven in – from Detroit. The delay would be five hours. I got in line to talk to the airline person behind the desk. Behind me in line was a young woman who was lamenting already that she wasn’t going to get home, that she was going to miss her friends in Oregon who were going to drive with her, that she was going to be stuck. I turned to her and said that I was setting the expectation that I’d be moved to a direct flight, in first class, seated next to a celebrity I’ve always wanted to meet. She laughed and marveled at my positivity. I told her we get what we put out there. Well, when I got to my turn, the airline person typed and typed on his computer and said he was unable to find me another flight since the storms out East had caused so many people to need to get on flights. Everything else was full. He encouraged me to try calling a representative of the airline from the phone bank in the middle of the room and see if someone there could help. So I did that, determined not to give up. After a long time on hold, and another long conversation with that airline representative, I was again told that there were no flights that could get me to California until the next day. My weekend was already short, so a full day’s delay for one day in California was not going to be possible. The airline representative suggested I call someone from the other airline that my itinerary included. I called that airline, and after a long hold was speaking with another representative who was also unable to get me on another flight. Sadly, I got back in line to ask for a refund for my ticket. As I stood in line to speak with the airline person, I was leaving tearful messages on my sisters’ voicemails saying that I wasn’t going to make it and that I was so sorry. The airline person saw me. When I got to the podium, he started typing on his computer. He said he was going to be creative and try to find me a way to get there. I stood and silently asked the angels for help getting me to California. He typed and typed. He called someone and talked to her. Suddenly, he said “I got it!” and he hung up the phone. He had found me a flight to Detroit that connected to a flight to Los Angeles (see the word “angel” in there? ), getting me to CA just two hours after my original arrival time. I took it. I also hugged that guy and thanked him profusely. The gate to board the Detroit flight (which was leaving in 10 minutes) was right next to the gate I was at currently. I walked over and sat down until we boarded. As I sat, I looked at my boarding passes. The seat for my flight from Detroit to LA was in first class. Everything went smoothly to Detroit, and getting on my flight to LA. As I sat in my seat on the Detroit-LA flight (next to a charming guy who has the difficult job of working for Toyota), I was reading a book I’d brought. The author mentioned cheesecake and I thought “yum, I’d love some cheesecake. Maybe I’ll be able to have some in California.” When the flight attendant brought our meals, just about 10 minutes later, wouldn’t you know there was a piece of cheesecake included? The angels arranged for dessert too, I guess! I spent a wonderful weekend with my sisters, one I’ll never forget. I am beyond grateful that I had the opportunity to go, and also for the lesson that there’s help if you stay positive and ask for it. Wishing you many moments of awe and wonder.